This review was originally posted at the filtered lens. By this point, we don’t really need to be reviewing Radiohead’s albums. Their last, 2011’s “The King of Limbs,” shocked audiences by getting a reception that was only pretty good, not great. Nothing noteworthy for other bands, but a huge misfire for them (and, personally, it’s one of my favorite RH albums). They’re a cultural institution, changing themselves and popular music with each release. They’ve done it again here, on their ninth album “A Moon Shaped Pool,” an album that balances emotions just as it balances its instrumentation. The most immediate sound on the album is the alarming strings of opener and lead single “Burn the Witch.” It’s a very compact song, clocking in at 3:41, relatively short by the band’s standards. It has that catchy, staccato string rhythm that’s somewhat infectious, unexpected for a band that doesn’t exactly have the most whistle-able tunes. The second song and second single “Daydreaming,” hits the much more familiar other-end-of-the-spectrum, a 6+ minute haunting electro-ballad. It’s a gorgeous song, equally enthralling and terrifying. The two songs, released close together and playing back-to-back, are uniquely different in a way that doesn’t exactly work, and to have them kick off the album seems like it’s setting a path for an album of great songs but with a lacking cohesiveness. This couldn’t be less of the case. Other reviewers have used the word “symphonic” to describe the album, and it settles into that kind of groove. The next four tracks – “Decks Dark,” “Desert Island Disk,” “Ful Stop,” and “Glass Eyes,” act as a massive (and excellent) suite. “Decks” transitions into “Desert,” and although the other songs aren’t connected, there is a real vulnerable and murky tone to the songs that draw the listener for quite a while (about 17 minutes, through the four songs). And just when that set starts to feel a little worn-in, they turn on a dime to the more rhythmic “Identikit,” one of a few songs they’ve recorded for the album after playing them live for years. It’s not an energetic track, but it feels like after the previous five. Radiohead’s best albums have a real cohesiveness to them, and “A Moon Shaped Pool” is about as cohesive as they come. The biggest outlier is “Burn the Witch,” with a bursting energy not found anywhere else. A majority of the tracks are slow-burning ballads, to varying success, although most are sheer Radiohead brilliance. “Glass Eyes,” the shortest track, is also the most effective. Closing song “True Love Waits” is the same (and another song that Radiohead has been kicking around for years). The album shares a cohesiveness with “Kid A,” but without doing a retread of that album’s murky synths. There is a lot of synth here, but it’s a more spellbinding and complex use of them, and occasional strings and acoustic guitar work to fully complement the otherwise electro-heavy music. As with some of Radiohead’s other albums, the lyrics don’t take a full priority. Between the importance placed on music, and Thom Yorke’s typically high-flying and jumbled vocals, the lyrics aren’t always the most discernible. Still, “Decks Dark” has a great line, “There’s a spacecraft blocking out the sky,” which complements the song’s spacey feel (that would feel in place on “OK Computer”). 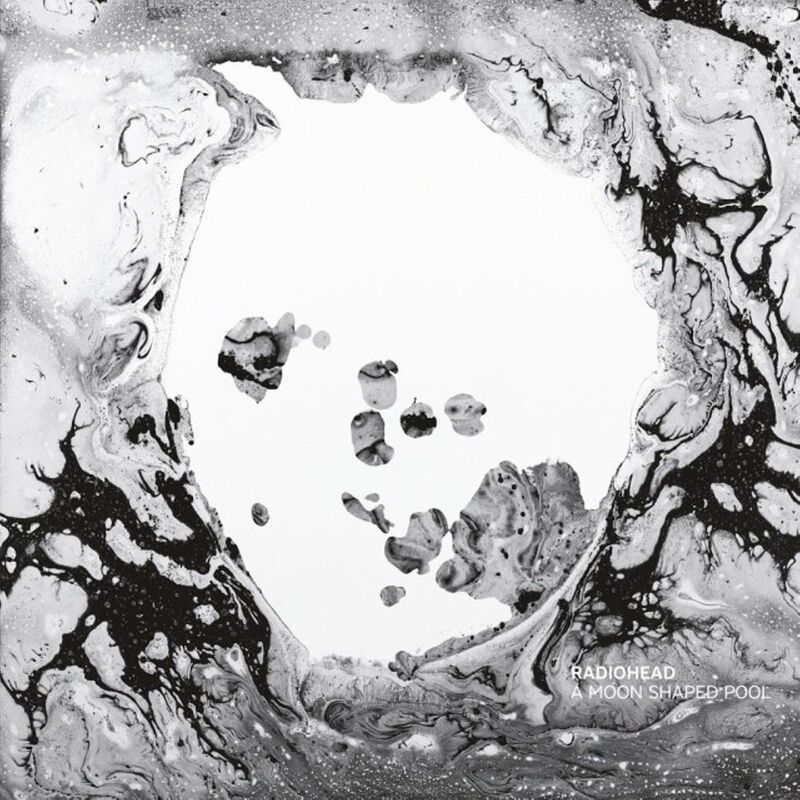 This certainly isn’t one of Radiohead’s most accessible or immediately enjoyable albums. In fact, some of the tracks might not even sound great individually. This is an album meant to be consumed whole. Their last two albums, “In Rainbows” and “The King of Limbs,” had pop standouts that you could listen to and love immediately – this album is more of a grower. In time, it’ll go down as one the band’s best albums yet, but we have to give it time to get there. Trust me, give it the time.